It’s that time of the year when we want our homes to be cozy, to exude warmth for the soul, and yet we fret about making our home decorations perfect. As my sweet daughters and I strolled up our drive, I wondered at the splendor decorating the trees. I knew that the most glorious decorations come from the simple beauty within our everyday surroundings. 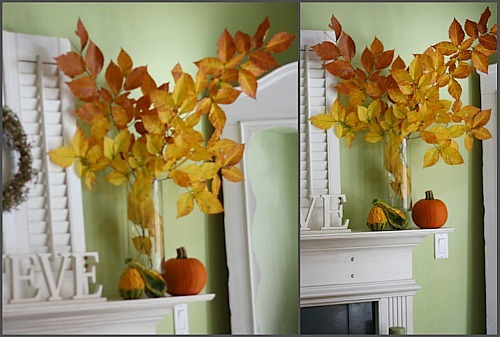 Have you pondered how to create some easy Thanksgiving decorations without spending any money or time? Does that sound to good to be true? Enjoy your outdoors and create cozy, fall decor at the same time. One of the easiest ways I incorporate any kind of home decor into my seasonal looks is by decorating with nature and bringing the outside in. 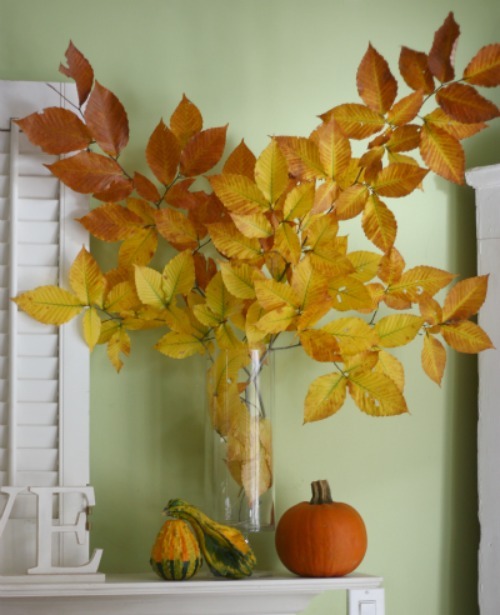 With any yard sale vase and a few snips of your branches, you can create a statement piece that takes only one minute to produce. I have never given a photo gift but my daughter gave me a beautiful book of my granddaughter’s first year. Personalized gifts are the best! I have been giving them for years and usually use snapfish actually! Our family loves calendars, photo books, mugs, etc…! Jen – that is a great idea IF you live in an area that has fall foliage – however, I live in South Florida and I haven’t seen this kind of color since my husband and I moved from the mountains of North Carolina! Does that mean I don’t decorate? Nope, I still do. I just have to use artificial. I would love for you to check out my blog and see some of my decorating ideas and let me know what you think. Thanks! We haven’t done personalized gifts in awhile, but always try to give pictures. We’re going to attempt ornaments & other crafts this year! I love this! I was just outside looking at my highbush cranberry wishing I could capture the brilliant foliage with my camera. It just wasn’t working for me, however, I could bring a few branches in and put them on my dining room buffet and still enjoy them.